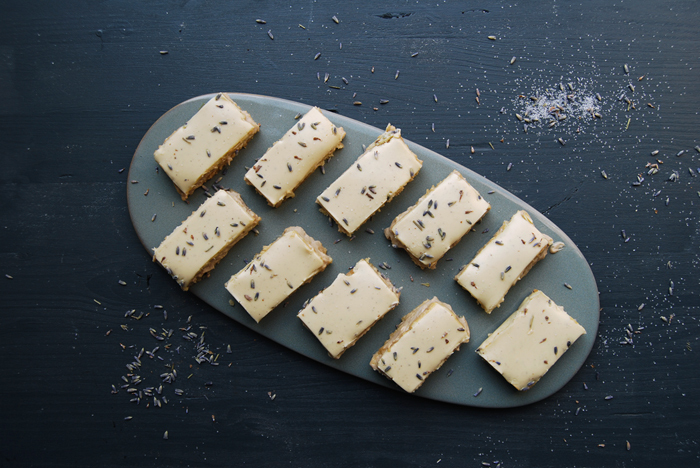 This is advanced lavender baking! 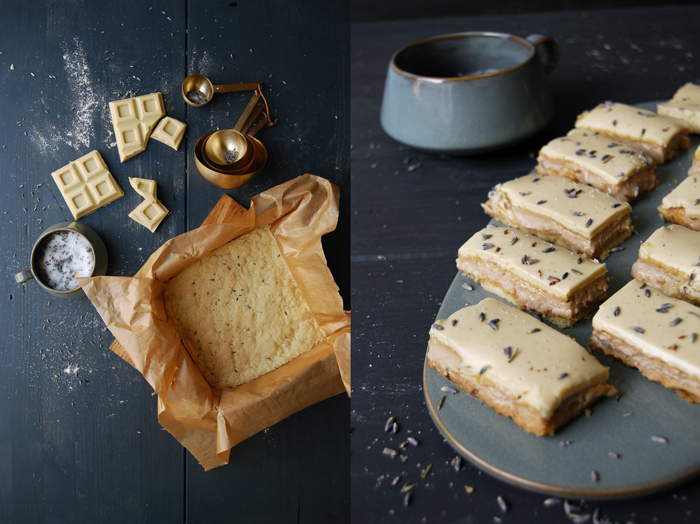 When I shared my Lavender Gâteau Breton recipe with you a couple weeks ago, I mentioned Frances Bissell’s fantastic baking book, The Floral Baker. 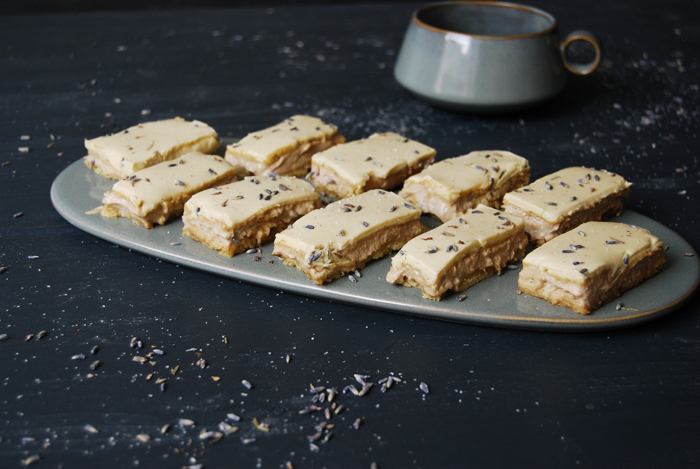 The renowned British cookbook author inspired me to give the aromatic blue flowers a try in my kitchen and to add them to my own baking. I started off with the preparation of a jar full of lavender sugar about a month ago, the floral sweetness needs some time to develop its exhilarating qualities. For my buttery French cake, the Gâteau Breton, I sieved the sugar and used the florets just for the topping. I wanted to take it easy at first, to get used to this new flavour and to avoid straining my taste buds without even getting started properly. So now I felt ready to take the next step, the advanced level of floral baking. I got in touch with Stephen from Serif Books to see if I could share one of the floral master’s recipes on eat in my kitchen. We got along very well and I found out that Frances lives in England and Gozo and also includes traditional Maltese recipes in her cooking. I really hope to meet her there one day for a meet in your kitchen feature on the blog! After reading her book I felt quite torn between a few recipes but in the end I went for Frances’ Lavender and White Chocolate Caramel Cake. It sounded so decadent and rich that I had to give it a try. The creation is based on her mother’s recipe for toffee cake and it has been in her family since the early 1960s. 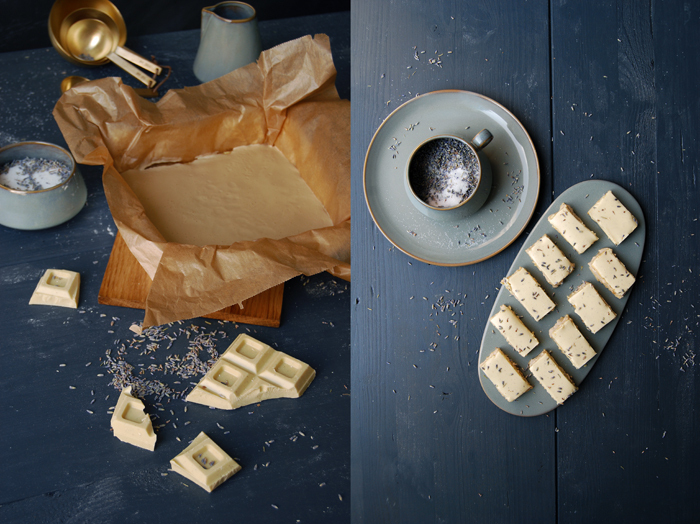 It’s like Millionaire’s shortbread, just with white chocolate. 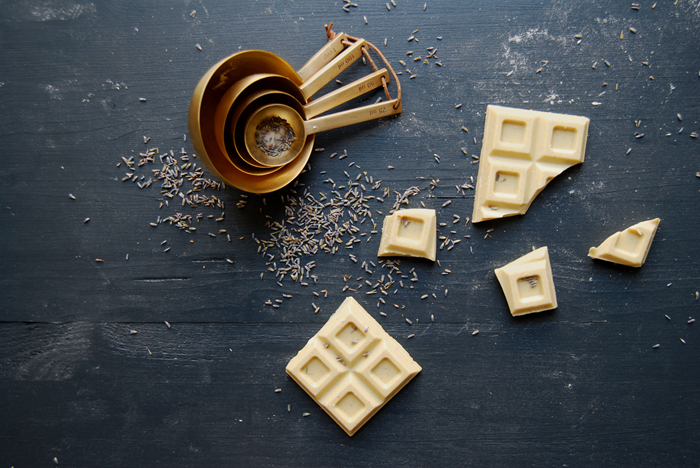 It starts off with a thin shortcrust base infused with the beautiful aroma of lavender, topped with toffee cream and a final layer of crunchy white chocolate. The creation looks a bit old fashioned which I love, it’s the right treat for high tea with the ladies, when you bring out the nice porcelain and get dressed up. I didn’t use my bone China at my table but another gem I found recently, the beautiful plates and bowls (and my beloved new measuring spoons!) by Ferm Living in Denmark. 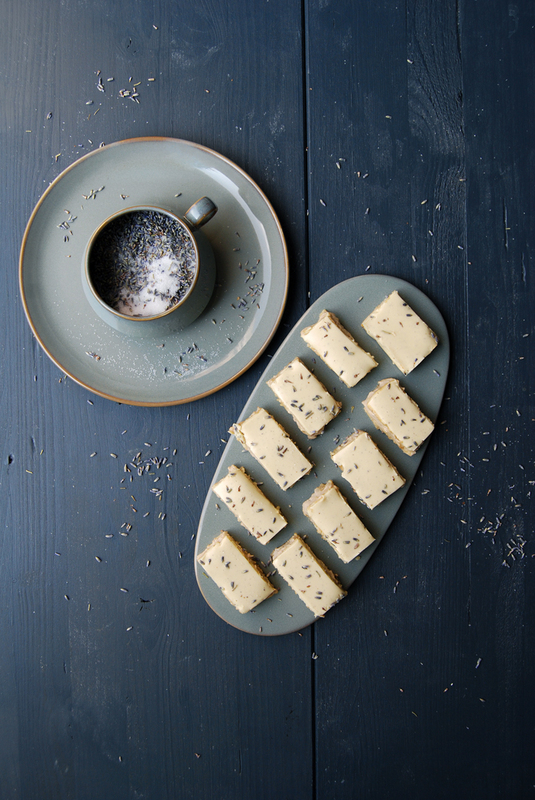 It’s a clean, grey stoneware collection inspired by Bauhaus classics. My friend Anne, the photographer I mentioned last Sunday, told me about their stunning designs, she knows that I’m always on the lookout for nice tableware. Luckily, we have a similar taste, which is quite minimal, and we’re both picky, so I found the perfect design scout for me! And thank you for 10.000 followers on eat in my kitchen’s Instagram!! 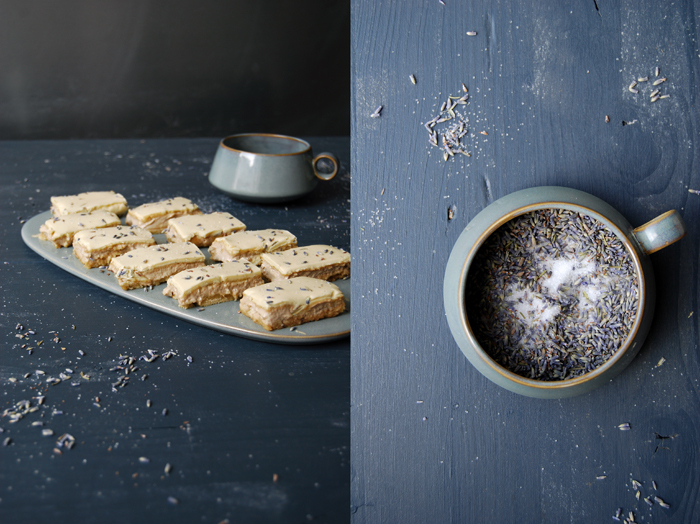 Mind that you prepare the lavender sugar a few days (or even weeks) in advance, 10 parts sugar and 1 part organic lavender flowers (L. augustifolia, Hidcote). Set the oven to 190°C / 375°F (fan assisted oven) and lightly butter the cake tin (or line the tin with parchment paper). 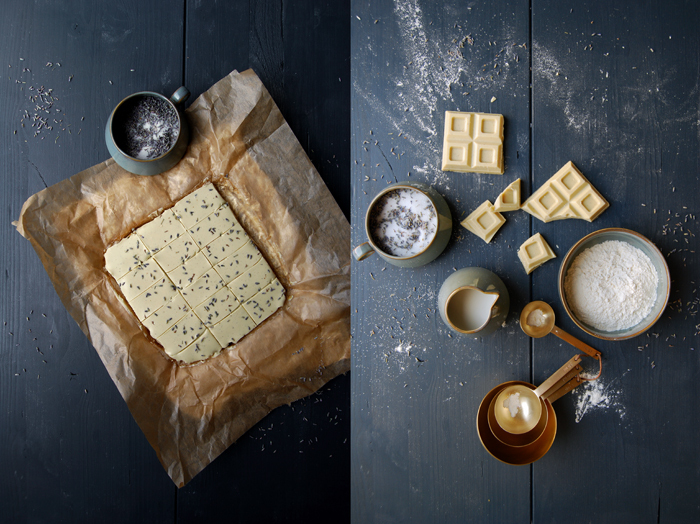 For the shortbread, mix the flour, lavender sugar and butter with the hooks of your mixer. Press the dough into the tin and bake for 12-15 minutes. Remove the tin from the oven and leave the shortbread in it. For the toffee, pour the Golden Syrup and the condensed milk into a saucepan, stir together over moderate heat until well-mixed, then boil precisely 7 minutes, stirring all the time. Spread the mixture over the shortbread and allow it to cool. Melt the chocolate in a bowl over hot water, mix in the essence if you would like to use it and spread over the cooled toffee, marking into small triangles, squares or fingers, as appropriate, before the chocolate has set. Sprinkle with lavender flowers. Cut when cold. This sounds utterly divine; what a wonderful combination of flavours!